Remember those choose your own adventure books that you used to read as a kid? As you read through the book, you come to these points where you have to make a decision for the main character, and depending on what you chose, a tailored adventure would divulge itself. It always seemed like death was a common ending no matter what path you chose though. Michael Niggel of Hazard Creative took a look at Journey Under the Sea, and mapped out all possible paths. It turns out that death and unfavorable endings are in fact much more likely than the rest. That somehow seems wrong, no? I liken it to something like… even in your own fantasy, you die or end with an unfavorable outcome. Such is life, I suppose. View the full-size version here [PDF]. I never ‘played’ that specific book but in similar other books success seemed quite likely, despite the many ‘dead ends’, since you could make conscious decisions based on the information you had (versus completely random choices). There was a BBC story this AM about a Graham Greene mystery story had only the first chapter written before he died. They were talking about how it could end and Choose your own Adventure was one of them. I had the first 10 books right when they came out in 1979 and thought they were a blast. This shouldn’t be all that surprising. It’s an adventure, so you should have to work long and hard to a happy ending. Any early endings should be unhappy. If the favorable outcomes were distributed 50/50, then you might hit a happy ending on your fifth page, which seems anticlimactic to me. I remember this one being harder than the others. There was also a cave one (though that may be part of this one). In other words, I do remember quite the variability in the books with some that I would have to “try” and die. Of course, I’m a sample of 1 and I had no a priori so my “trying” something was pure chance. On a more important note, the graph is beautiful. The only thing that I would have loved to see differently was that memorable font used on the book used somewhere in the graph. 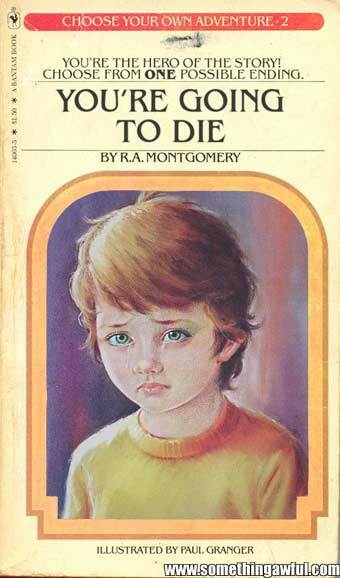 I never played the Choose Your Own Adventure series when I was a kid because I figured out very fast that almost everything led to death, for no reason. Fighting Fantasy and Lone Wolf were far superior series. You made informed choices. You could get to the end without cheating (difficult, but possible). The beauty of these books was that you could always rewind, then choose a new path if things didn’t work out. Some may call that cheating… but I prefer to think that I was just learning about depth-first search algorithms. These kind of maps have been around for a while. Building on an assignment that Matt Kirschenbaum had his students do at the University of Maryland, I regularly have my new media students map out CYOA books as an early example of “ergodic” literature. I’d note that most of the deaths have several features, like easy backoff. That is, it’s not like there are entire subtrees that kill you: rather, most places allow you to flip back to whatever your finger was just on and go read another path. I remember getting that particular book in 6th grade after I broke my arm. Those books were a lot of fun. Nice work by Michael Niggel. Thanks for posting that. Oh yeah, Lone Wolf was great too. not only is this not wrong, it was the whole point of the books. you were supposed to have more bad outcomes than good. like life. there was a competing series of CYA style of books that had only ONE happy ending. they are supposed to make you think about what is the best choice to make in each situation. One correction though: the arrow between 29 and 45 (roughly in the middle) should be yellow; there are no favourable results on that branch, only neutral and unfavourable. One correction though: the arrow between 29 and 45 should be yellow; there are no favourable results on that branch, only neutral or unfavourable. In my fantasy, people use “you’re” and “your” correctly. I think the most interesting result here is that even though there are about as many happy endings as deaths, it takes a very specific path to get to each of the good endings, whereas you’re quite likely to reach a fatal ending by choosing randomly. Yes, there’s several chains where you must make correct decisions 3 or 4 times in a row, or meet an unfortunate end with any of the wrong decisions. Loved those books as a kid! I recently read a newer zombie-themed one that’s written more for adults. There were over a hundred endings and like 95% of them were gruesome death! Super fun. It’s called “Zombocalypse Now” — i think it’s on amazon.